I’ve compiled a wedding photography checklist with a few tips to help you make the Big Day run smoothly. Shooting a wedding always comes with a certain amount of pressure. You have to get the job done right because there’s no chance for a “do-over” if you miss the shots! A little planning and organization can save the day. I’ve also got a checklist for the bride and groom, and a wedding photography shot list. Wedding photography checklist item #1 is preparation. As Benjamin Franklin said, "By failing to prepare you are preparing to fail." Visit the location ahead of time. If you are not yet a confident photographer, try to visit the location ahead of time, preferably in the same lighting conditions as you will experience on the wedding day. On the other hand, if you have been shooting for a long time, and are able to quickly assess lighting and locations, then just make sure you arrive fifteen minutes to half an hour ahead of time to allow yourself a little scouting time. Know your gear inside out. If something stops working, you need to understand it well enough to be able to troubleshoot. You may be called upon to improvise if something fails. Check your gear before you head out the door. Double check that your camera and flash are all working well. Make sure your sensor and lenses are clean. You should have several spare batteries, all fully charged. Don’t forget a stockpile of memory cards and a portable storage device for backup. Have backup gear. You need to have a complete set of backup gear available at the shoot. Charged batteries do die, and sync cords do fail! Lenses get dropped, and cameras can be damaged when tripods tip over. Be prepared! Take your cheat sheets along. Don’t forget to take your cheat sheets and your own wedding photography checklist with you on the day. They’re no good sitting on your desk at home! Verify all times and locations with the bride and groom a few days prior to the wedding. Plans do change, and it may slip a couple’s mind to let you know. Perhaps wedding photography checklist item #2 goes without saying, but I’ll say it anyway! Always be the consummate professional. Your reputation is on the line every time you shoot a wedding. Much of your business may come from referrals. Be on time. Being late is disrespectful, causes stress for your clients, and is plain bad business. Dress appropriately. You should be comfortable enough to move around easily, but that doesn’t mean showing up in jeans or sweat pants. You need to dress up a little to fit in with the formality of a wedding. It’s preferable that you dress in neutral colors, so you can be as inconspicuous as possible. Keep your cool. Wedding are stressful, and occasionally, an overly-tense family member, or member of the bridal party, will take that out on the most convenient target, which may be you, the photographer. Smile through it all, and keep your reactions neutral and calm. The bride and groom will appreciate your professionalism. They have enough to deal with on the Big Day without having to mediate disagreements. Wedding photography checklist item #3 is about the all-important element of communication. How long will you stay? Are you just there for the ceremony and a portrait session afterwards? Or will you spend most of the day with the couple, photographing preparations, ceremony, portraits and the reception? What locations will you cover? Are you expected at the bride’s house, the church, a park for portraits, and the reception hall? Come to an agreement ahead of time, and build the time and transportation costs into your fees. Is a meal included? Establish whether the bride and groom will provide you with a meal if you are to shoot the reception too. Either way can be made to work, as long as you know up front, and aren’t caught out going hungry! What style of pictures will you shoot? This is an important one. You should be as accommodating as you can, however the bride and groom will usually hire you because they like your established style. Will that be formal portraits, more of a candid/reportage/photojournalistic style, or some combination? You need a mutual understanding ahead of time on this one. If you are comfortable shooting candids, it can be a nasty surprise on the wedding day to find out that the bride wants more traditional, formal shots that are not your bailiwick. Show the couple a portfolio of your work so that they have a feel for your usual style. Which poses are must-have’s? If there are any shots the bride and groom must have, you need to know about them ahead of time. Perhaps the bride wants a picture with her best friend, or her grandma. Or perhaps she’s always dreamed about a shot of her bridal gown draped over a chair. If you don’t know, it might get missed. Keep a written list of these must-have shots with you on the day, and don’t leave until you have them! Provide this wedding photography shot list to the couple and have them check off the shots they really want. Make sure they are realistic about the number of shots they want, and the time available. Develop a rapport. Use whatever time you have in your meetings with the couple before the wedding day to get to know them as well as you can. 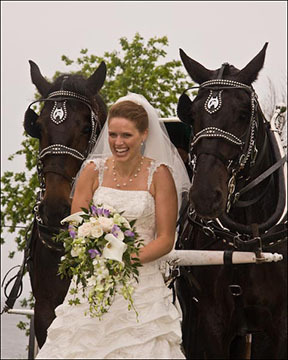 If you establish a rapport with them, it will be much easier to get natural-looking shots on the Big Day. If possible, you may want to arrange to shoot their engagements pictures as part of the package. This will give all of you a great opportunity to get comfortable working together. You will quickly learn whether you’ll get easy smiles or have to work for them. Sign a contract. Formalize your discussions with a contract that lays out everything you’ve discussed. See the next wedding photography checklist item for more details. Wedding photography checklist item #4 deals with the contract. No wedding photography checklist would be complete without mention of a contract! You may think of contracts as formal, wordy and cumbersome, but they are absolutely essential! They protect both parties in case of disagreement. A contract is actually a great way to make sure that communication takes place, since you’ll need to formalize everything I discussed in the wedding photography checklist item about communication above. You should include the who, what, when and where. When and Where: All the logistics of locations, start times, and durations should be spelled out. Who: Who will be doing the shooting (yourself, a second shooter, etc.) should be stated in the contract. Note that most people will want that "who" to be you; they are hiring you for your unique style, and will be unhappy if someone else shows up on the day. What: The services you will provide should be enumerated, along with their associated fees, and agreed upon delivery dates. How and when will you provide proofs and final images? Via CD? On the web? As prints? Is an album or photo book included in the package? How many prints, and at what sizes? You need to cover a few contingencies. What happens if you get sick? Or if the wedding gets canceled? Have a pro-rated refund policy if only part of your services can be delivered. Try to limit your liability to only the amount that the couple pays. Clearly state when any deposits and the balance of fees are due. You should include a clause to state that you are the sole hired photographer. Your contract should state that you retain the copyright to your images. You may want to include a statement to let you use the images in your portfolio and promotional material. Remember that the bride and groom can only give you those rights for images of themselves. For any other people, you will need to get a model release. Finally, the best advice is to have your contract reviewed by a lawyer. It may sound like overkill, but it could save you heart-ache in the long run. The contract is there to protect you when things go unexpectedly wrong. Wedding photography checklist item #5 talks about planning. A little planning goes a long way. If you are organized, the day is bound to run more smoothly. The first thing you need is your own cheat sheet to remind you of what shots you need to get at each location, and whether there are any specific shots that have been requested by the couple that are outside of your normal repertoire. This wedding photography shot list can help you get started. Get yourself a helper. Ask the bride and groom to assign someone from the family who knows all the “players,” to help you find people and call them over when they are needed. This is the perfect job to keep that busybody aunt occupied! Group your shots in such a way that you don’t have to have both families and the entire wedding party milling around for the entire shoot. Deal with (for example) the extended family first, so that they are free to leave (and get out of your way!) Consider shooting elderly relatives first so that they don’t tire from waiting around for their turn. Have a shooting schedule. Your shooting schedule doesn’t have to be too rigid; it can simply have an approximate order of shots. You will want to share this with that busybody aunt who is helping, and also with the bride and groom ahead of time. Wedding photography checklist item #6 touches on the human element. Different personalities will respond differently to the stress of a wedding. At one recent wedding, the bride was relaxed and natural. In fact, she was quite a ham in front of the camera, and really enjoyed herself. The pictures came out beautifully! In contrast, at another wedding a few weeks later, the bride was the complete opposite. She was really stressed out, and didn’t smile a genuine smile all day. Brittle smiles that don’t reach the eyes are really noticeable in the pictures later. Do what you can to set people at ease, and make the session run smoothly and stress-free. Give the couple a pep talk, if need be, to let them know that this is their time to relax and enjoy the moment. Inject humor where you can. If you have the opportunity to do an engagement shoot with the couple ahead of time, it can help to build rapport, and lead to more relaxed shooting on the day. Wedding photography checklist item #7 talks about the things you’d rather not think about. Even a wedding photography checklist can’t prevent things from going horribly wrong from time to time. Besides being professional, you also have to flexible. Your mantra must be "Adapt, Improvise, Overcome!" Events are frequently running late, rings and flowers are misplaced, and emotions are running high. At a wedding, it’s best to expect the unexpected. Bad things do happen on both sides. Sometimes, as a photographer, you’ll make a mistake. Perhaps you’ll leave your ISO on 1600, and then shoot outside (we’ve all been there…). Perhaps your equipment will malfunction. Whatever happens, try to recover as unobtrusively as you can. If it’s simply not possible, then I believe that honesty is the best policy. Come clean, and redo a few shots if you must. The couple would likely prefer that you get the shots in the end. Remember an earlier item from this wedding photography checklist: be professional at all times! The other side of the coin is when you have to deal with unpleasantness from the wedding guests or bridal party. You may well encounter uncooperative guests, obnoxious family members, and even hostile officiants. On rare occasions, I’ve heard of a photographer being subject to sexual harassment. If these situations occur, the same rule applies. Be professional! Attempt to de-escalate the situation, and remain calm. If you are unable to resolve the issue quickly and quietly, however, there’s no need to subject yourself to abuse. In such a situation, your best ally might be one of the bride’s parents. Enlist their help in getting things back under control. They usually have a significant vested interest in having the day run smoothly. If you can avoid getting the bridal couple involved, do so. Sadly, you may also run into instances of clients not paying in a timely manner. A wedding photography checklist can keep things running smoothly, but remember: in situations where things do go wrong, it is your contract that is there to protect you. If you eventually need to seek legal recourse, your contract will be essential. Sometimes, however, issuing a partial refund to a dissatisfied client, even when you believe that you did a good job, and fulfilled the terms of the contract, is the easier (and less expensive) route to take. You may want to view the wedding photography shot list. Also, check out the wedding photography checklist for the bride and groom to see what I’m telling them to ask you!